Happy Monday poets! Today begins Thanksgiving week here in the states. We have two days of school and then students are out the rest of the week. Thursday is Thanksgiving & Friday—well, all I can say is that I will not be one of the millions out gouging each other in the eye to get the last great deal. I like Thanksgiving though, as there are no expectations. There are no presents or treats you have to take care of or someone to get upset over. We spend the day cooking, watching football, playing football, napping, taking a walk to try and wake up & just being with family. Today, I thought it might be good to stretch our attitude of thankfulness. Even if you don’t celebrate Thanksgiving this week, we have things to be thankful for. So, what or who are you thankful for? Happy Thanksgiving U.S.friends! 🙂 I am thankful for warmer days – we had a brutal cold snap last week that is mercifully over. (I know, I know – over for now! ha ha). I’m thankful for all of you wonderful and lovely dVerse voices – you all rock! Be well and be safe, and always find something to be thankful for. Sometimes it’s not what we get but what passes us by that should get the biggest thanks! ha. warmer days…i think your cold front made it here….freezing rain and ice over night tonight…i may be thankful not to have school tomorrow…smiles..
Bjorn is a poet and we all know it. I think you sent the cold weather our way… brrr! Thanksgiving would be such a nice relief in the middle of our long and dark autumn… turkey and long nice cooking sounds so nice..
smiles…great to have another year with your mom…most def….we will be with my father in law for thanksgiving, if we make it there with the nasty weather we are supposed to get tonight….and glad you dau is doind well too…smiles. We don’t have Thanksgiving in Europe, but just about every prompt I’ve read recently has been about thankfulness. I am thankful for family and friendship, warmth and laughter, music and poetry and the beauty of nature. makes a life of gratitude. is thanks enough, I believe. Love the poem.. and the happiness of giving is truly nice. wish there were more people that would do so.. I couldn’t agree more. Thanks for this, Viv. Viv, you said it so well. Lovely poem. that is a lovely little verse….was talking to the kids today about thankfulness…and i think we often overlook many of the small things we should be thankful for in comparison to the lives of many you know…. I’m thankful for that picture making my mouth water! Not good… it’s bedtime… I can’t be hungry now. ha. def looking forward to thursday to make that picture a reality…smiles. I’m grateful for friends, family and faith. For poets and poetry (and that means all of you). For nature in all her moods. For my husband and dogs! For another day to enjoy life. Oh, and for my kidney donor, Paula, who made that possible. Even for those not-so-fun things that have helped me learn, grow and better enjoy the good times. Happy Thanksgiving, everyone. Those of you who celebrate–watch out for heartburn and hangovers! Oh, and Happy Hanakkuh to my Jewish friends. Happy Thanksgiving back Victoria.. a little envy for this holiday and others — But on Sunday it’s the first of advent. and here we light the first of the four candles… mmm.. I love that advent tradition. It’s been a few years since we did it. You got me thinking. I am thankful for so much, not least of all my poet friends around the world. I JUST THOUGHT OF SOMETHING – ANYONE BEEN IN TOUCH WITH KELVIN? ISN’T HE IN THE PHILIPPINES? I WONDER IF HE IS OK. I SENT HIM AN EMAIL BUT DID NOT HEAR BACK. HE IS QUITE RESPONSIVE. I sent him an e-mail and haven’t heard back. Very worrisome to me. Glad you brought it up here. Brian or Claudia…do you know anything? OK … are we supposed to post a poem? I don’t see a place to do this????? I think just comments, Liz, like you did. No links on Monday posts. but hey if you wrote a poem let us know…i will gladly read….but monday is usually just in the comments…. Thanks Victoria! I appreciate that. Happy Thanksgiving to all my USA friends and I am filled with gratitude for ALL of my poet friends from around this earth. I am thankful that my mum is travelling from the UK to spend three weeks with us. Having family in the UK when I live in the US is hard, makes these times all the more special. I am also thankful for my husband who gets me and loves me for who I am . . . and for my pets who make me laugh. Happy Thanksgiving Brian and everyone else at dVerse, you guys inspire me. Happy Thanksgiving to all of the USA poets. As many have said already , we are fortunate to have dverse to showcase our work and communicate with like minds. I hope you all enjoy Thursday. Enjoy Thanksgiving. Our Christmas festivities are already beginning in Australia and there is always a long, slow, fun month which leads up to Christmas and New Year. Then again, summertime is always party time. Gratitude! I’m getting better at noticing the small things, like a friend bringing the mail up from the first floor … like eyes meeting and smiles. I have such mixed feeling about Thanksgiving Day itself as a holiday. I belong to a network learning to understand indigenous peoples issues, like the true stories of the day in history. I am grateful that I never learned that kind of fear and hate and destruction, that I will spend the day with my family cooking and eating together, that my 90 year old parents in upstate NY are still independent–driving themselves to the party in Ohio. And then health and etc. I could go on for an hour I think. Happy safe end-of-year gatherings and love to everyone. Happy Thanksgiving all! I ‘m thankful for the “little” daily blessings: a walk with the dog, a hug from my man, laughing with my son(s), and breathing the crisp November air. Thankful too for the beauty of words…all YOUR poetic words that shine beauty in an often ugly world. Please pass the turkey! Love this thoughtful post and wonderful comments, Brian. I considered your question about what I am thankful for and the thing that topped my list is my sanity. I don’t mean this lightly…..the more I hear and read about Alzheimer’s, and the fact that it has now touched a friend of mine (a brilliant lawyer, classical music expert), the more thankful I am for mental health, quirkiness and bouts of depression included! I’m exhausted. Taking care of my 4 year old grandson, sometimes caring for my newborn granddaughter and caring too for my daughter and son-in-law. Think I’m complainging? Not. I couldn’t be more grateful for my little family and the fact that I can help out. Oh, and hubby, he’s home baking. Will join us tomorrow. I’m so grateful for this and so many other people and things. Hope everyone has a happy week and can find so much gratitude that, like me, you can hardly express it. Happy Thanksgiving. Thank you Brian for inviting our thoughts. In Canada, we celebrate Thanksgiving on the second Monday of October. 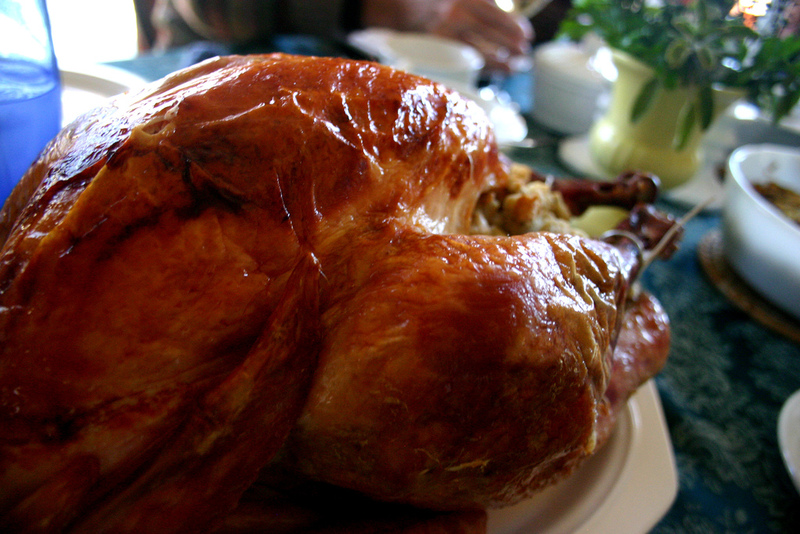 If you do a little googling you’ll see that the first Thanksgiving originated in Canada. It is interesting to look at the slight differences that we have. Our Thanksgiving focuses on “harvest” time. It involves a three day weekend, but really is about one day. Turkey and pumpkin pie….oh yes!! Giving thanks and being grateful for all that we have seems to be the common element. The native daycare that I work at has a Grandparents Feast, reflective of their culture and giving thanks for all that the “Creator” has given them. I am thankful for family, friends, love and health. I am blessed with wonderful opportunities such as this little place to say hello and share the words that flow from my heart. We are all different , but we are the same. Hi everyone, late to the party, but I loved reading everyone’s comments of thankfulness. There’s something about that, taking a moment to step back with heartfelt appreciation … somehow just doing that fills me up. I am very thankful to have been welcomed amongst such a positive and diverse 🙂 group of poetry lovers! I haven’t been around very long but the short while that I have participated with y’all has really blessed me. Wishing you all warm hugs on a chilly night! Although I am a bit inconsistent myself in life; I am thankful and reassured that the Pub is always open. Just to read and share with others is an honor. Thank you all for your writing, reading, and sharing your comments to help us along in the pleasures of sharing and writing! I would like to echo the comments made here of gratefulness for this place that is so accepting and open to all who come here to express themselves in writing, for the beauty of the world, friends, family, and health…and as Susan stated, appreciation of the history of the occasion’s true, difficult stories of the origin of the first Thanksgiving – and of those around the globe who live under strife and worse living conditions – if only we could share more with those who are left out.